I have a five year old son named Solace and an amazing husband who accepts me for who I am even though I am a huge nerd...and enjoy writing fanfiction. I also love my amazing beta, Creature of Shadow! Updated 09/21/14: I can promise I'll have updates weekly or bimonthly or something like that, but the truth is: I'm really bad at keeping a deadline...so, unfortunately I can't promise anything. I can however say that I am greatly encouraged to write when I get reviews and I would love if peoples would do fanarts of any of my stuffs (it would literally make my life!! lol)...and messages asking me to...cuz then I feel bad for not updating sooner :/ I have a lot going on, but I am SUPER trying to catch up on my works!!! :) I am finally done with wedding planning, so keep an eye out for updated work!!! ~One-Shot~Lemon~ "Sesshou..." she whispered to herself. "Koi." She smiled as strong, masculine hands wrapped themselves protectively around her petite waist, clasping the fingers of his right hand with that of her own. She shivered at the feel of warm breath whispering across her exposed neck before soft lips found their way to the mark on her neck. 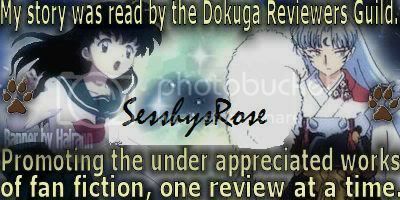 "Now, alone in her bed, sleep deprived and more than a little afraid, Kagome sobbed. She was alone in the world…she was alone, and she was…pregnant…" Nominated for Best AU, Drama, and Lemon Scene in 2010 4th Quarter Dokuga Awards! Sesshoumaru and Kagome talk of the future, but are things really as they seem? A sport a century and a half in the making rears its head in the modern world, but the questions still stands, what is the best way to catch a Miko? Kagome purchases a couple of portraits for her and Sesshoumaru's house...could they be why strange things are happening? Pure crackfic written for LadyNaomi! Christmas Eve and Sesshoumaru still doesn't have a present for his dearest...what will he do? Written for Angelic Memories in Nao-chan's 2010 Exchange Pure Fluff!!! They had both lost so much, and the Christmas season was always a reminder of that loss. Can Sesshoumaru and Kagome find a way to overcome their separate griefs...and help each other gain the happiness they lost? Written for "Drabble December!" r0ozilla rampages on unsuspecting dokugians! Dokugasona Cast @ the onsen! Thank you so much for the review on my story "Pain!" I am glad to hear you like it and can only hope you'll continue to read and review! Welcome back!! Though I have to say my attendance here is kind of spotty as of late, I mean . . . I check in often, but I've got an attack of what Mikki has labeled 'mommy-brain' that's really gumming up the creative processes, so I haven't written anything in a while. Hopefully that will change after the baby's born. After my last one was when I first got into writing fanfiction in the first place, so I'm hoping to use that creative energy to respark all my writing stuffs. That's great! .... I mean about selling your baked goods, not the tornado sucking up your former home, that's parts just nutty . I'm glad you guys are okay, and hope none of your friends or fam got caught up in that- physically or metaphorically :/. On the baked goods thing, I think that's awesome- I know you're probably exhausted, and yes, crazy busy, but it must feel so good to be making money on your own like that- you have your own business! May be small, but that's how the best, most family-trusted ones start! Don't worry about the reading, you'll get to it when you can- rl comes first, we all know that, and you've got a LOT going on. Oh, ahem.... Whenever you do get free time, you owe me an entry for my Haunted challenge. I didn't forget. Well, I actually did for a bit there, but for some reason there was this sudden in flux of interest in the challenge. Like seriously no clue what happened but suddenly a few people dug this up out of the forum logs and went 'ooh, me, too!' .... I had to throw the banner together real quick, lol. Hey lady! We haven't talked in forever, just wanted to drop a line and see how things are going with you and yours. *huggles* Miss you! Ah, we do have a PS3, but DA 2 is for our Xbox 360 and use the PS3 prodominatly for Netflix and playing Blu ray XD. As for the story . . . yes, I know, I left you guys with another cliffy! I'm sorry, force of habit. See when I first go into writing fanfiction forever ago I was never certain when I'd be updating and I wanted to give the readers reason to come back for more whenever I did manage to post, so I got in the habit of treating each chapter like a mini-novel within a series, ya know with intentionally placed loose ends and such. Awww *hugs* Thanks, Rose. I've just been taking a bit of a break, making sure I've got my head on straight and things are going smoothly IRL, but I should be officially back next week. I miss you, too, don't worry, can't get rid of me that easy! Hey now, we all know that Sessh is gonna find out eventually, it's just the question when and how. And cut Kags some slack, the only reason she's in this mess in the first place is because the demon pegged her for being in love with the professor and used her need to protect Sesshomaru against her. She's also not very experienced in romantic relationships or physical relationships, so it's natural she would begin to get confused, but she's never really that far detached from the idea that she's dealing with this nonsense as best she can because she is trying to protect him and is operating under the impression that she might, somehow, be able to remove the thief from sessh without Sessh ever having to know about everything. And that's not even like 'OMG he can't know what I've done' but her worry about what how finding out he had a demon inside of him would hurt him. Oh and not to worry, we'll be seeing Myoga again, soon! Things are about to get a little nutty XD. I am so glad you liked my cosplay picture! I am always happy, if my works can amuse people!